As wedding season is quickly approaching, Mixbook has launched gorgeous, new wedding stationery sets that complement this year's popular nuptial trends. Whatever style wedding you chose, Mixbook has an invitation to match your big day. Are you a rustic couple? Modern? Looking to upgrade the traditional wedding theme? We've pulled some of our new designs to show you how you can incorporate today's popular wedding stationery into your overall theme. The succulent plant has made an appearance in home decor, gardening, and weddings since last year. 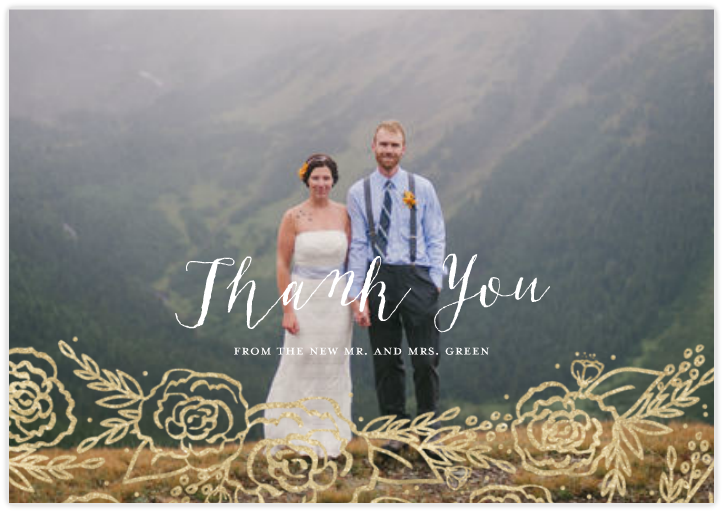 The muted tones of green have become easy to work with and are more gender neutral when representing the couple. Our Succulents wedding invitation and matching suite is both modern and beautifully illustrated. The earthy and classic feel of this theme would be perfect for a minimalist couple. The term rustic has been around for a very long time. An adjective that describes a look and feel pulled from the rural countryside, today's rustic is a bit more modern than traditional. Our Rustic Wood Typographic design is just that! Wood decor and design is highly popular now. Finding it in craft work, industrial styles, and contemporary designs, it is a beautiful material for weddings. This is another great choice to highlight both personalities of the lucky couple. A blend of masculine and feminine, a rustic wedding could be outdoors among the pines or in a cozy barn with string lights. There are so many creative ideas when using wood textures in your wedding. For the traditional couple looking to add some spark to their big day, gold is the perfect accent to a wedding. Mixbook's Golden Floral design matches this balanced mix of subtle and standout style. Gold has the design power to carry a wedding theme. Matching traditional aspects of a wedding (like lots of flowers) with gold opens up creative opportunities in decor, dress, and the food! It's one theme that can definitely appease picky parents and uphold some of the traditional or conservative choices. Definitely go for gold and you'll shine on your special day. For the fun couple who loves to make a statement, watercolor and its textures make a big splash in 2016. The soft pastels and calming hues create a bright and joyful atmosphere. Start the fun with our bright and poppy Colorful Watercolor Floral wedding invite! A great theme for a city wedding, garden party, or Southern Bell, these colors are just pure fun. Bridesmaids and groomsmen can play with the fun colors too, using them on dresses or ties. If you're planning a spring fling wedding, go with a theme as whimsical and beautiful as watercolor.